You will love Copper Moon Coffees rich wonderful aroma from their 100% Arabica single serve coffee. Each cup is crafter using the world’s highest quality beans. They carefully roast these specially selected beans, then perfectly grind and package them to ensure you experience the peak flavor of each unique coffee. Each cup you brew will produce a truly satisfying cup of coffee every time.CAFÉ COFFEE BREWED BY YOU: Start each day sipping a cup of coffee as flavorful as they serve in a coffee shop. Whether you enjoy organic or fair trade beans, single origin brews, or full bodied dark or medium roasts, we have blends in your flavor profile. 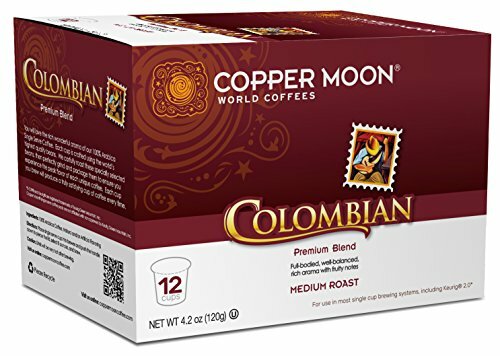 SINGLE SERVE KEURIG K-Cup BREWERS: Copper Moon Coffee’s single coffee pods are compatible with Keurig 1.0 & 2.0 K-Cup Brewers & most single serve coffee brewing systems. Savor the flavor of Copper Moon Coffee, with the convenience of single serve brewing. SINGLE BATCH ROASTED: At Copper Moon Coffee, we roast single batches of beans for the best flavor. Our variety of origins, blends, & roasts bring you the freshest coffee to brew & serve, with a delightfully full body & creamy, smooth finish to each sip. COPPER MOON MOMENT IN EVERY CUP: A Copper Moon is when the sun, earth, & full moon align in a single, delightful event. Each sip of a cup of Copper Moon Coffee is a similarly singular & delightful event, the perfect blend of fresh beans & careful roasting.